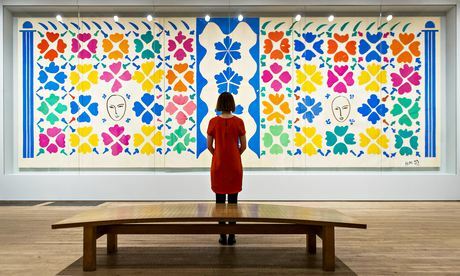 We were promised proof that Henri Matisse was “one of the most innovative painters of the twentieth century” but instead all we got was large-scale graphic designs. I was disappointed by this exhibition, to hear all the hype this show was going to set the record straight about Henri Matisse but I came away with the impression that this show had been put together purely to pander to popular tastes. I can only assume that together Nicholas Cullinan, Flavia Frigeri and Nicholas Serota decided they wanted something pretty, colourful and exuberant on their walls that demanded no thought whatever to appreciate. So they assembled this over-blown tribute to an artist who can never hold a candle to, yes you know what I’m going to say, to Pablo Picasso. I’d like to ask the organising team, how they think that this show can add anything to our knowledge of the great developments in contemporary art in the 20th century? I humbly suggest that the answer is, it doesn’t. It is pretty, it is colourful and it is a great testament to the artistic imperative to create in the face of overwhelming odds. He did produce some great paintings early on and his influence on the young Picasso must be acknowledged. But I am afraid Tate Modern has let the old man down and done nothing to position him as one of the great innovators of the twentieth century. As I walked around the Tate Modern one name kept popping into my mind, and when I tell you who I know you’ll gasp, but the truth is Clarise Cliff decorated early twentieth century pottery with similar exuberance and used a palette of brave colour combinations too, channelling the Jazz age in much the same way as old Henri did at that time. To produce work like this when you are old and infirm is a truly great achievement, I can agree, but when it comes to new ways of depicting human life and delving into the great issues that plagued Europe at such a dark time in its history then I’m afraid these crafty cut-outs don’t even come near. They just don’t do it for me.